FREE $50 VOUCHER TO SPEND AT HAPPY BIOME! Some of you know that we are Independent Distributors of the very wonderful Young Living Essential Oils. We love these 100% pure, therapeutic-grade oils, and use them to make all our Happy Biome products, and in our DIY Toxin-Free workshops. If you’ve been to our workshops, you’ll know that I’m never ever pushy with trying to ‘sell’ you these oils (mind you, they’re pretty awesome, and sell themselves anyway, haha!). I am more about empowering and educating you to make switches to more natural ways of living and being. I’m very open to having all oily-users (and non-users) at our workshops, regardless of what brand you use. However, if you have been thinking about trying Young Living oils, we’re offering a FREE $50 Gift Voucher to spend at our Happy Biome studio or on our online store when you sign up with us as a Young Living Wholesale Member on a Premium Starter Kit (similar to the kit in the photo, plus a Thieves essential oil, diffuser and samples). If you’re interested in finding out more, please feel free to contact us! This offer ends 8 July. I’ve been using Young Living essential oils for almost two years now. I originally started using them after having Elsie, when my health wasn’t feeling great. I was lacking in energy, feeling quite thin physically and emotionally, my immune system was not up to scratch, and my patience with my toddler was very flaky. While I was looking for a recipe on my Move Strong Gym blog (the gym my husband and I own), I stumbled across my first blog I wrote about my three-month-old experience with essential oils. I was pretty smitten back then – and admittedly, I still am. I thought I’d share my ramblings here with you! …..
“I have a new addiction. It involves sniffing and licking and relishing in a rush of euphoria. And no. It’s not crack. Ha, not even close. While that stuff is toxic and destroys cells, this stuff – my stuff, my little goody-box of addiction – go cell-deep to restore and nourish. Essential oils. My new addiction. Oh how I love you, you little liquid bottles of beauty. I pulled out some lemon oil last tonight to rub on Elsie’s belly for her constipation (she’s just started eating food and is having a little trouble, you know, gettin’ ‘em out). After I rubbed the oil clockwise around her abdomen, I bent over to inhale her lovely little lemon belly in, and then (ok, so this is a bit weird) I licked her! I licked her luscious little lemon belly and smiled as citrus exploded on my tongue. Chris burst out laughing, and made some comment about my addiction. I said, he couldn’t talk – him watching footage of himself again, for like the 50th time, dressed up as an elf pulling our Move Strong Christmas Parade truck. He thought he looked pretty tough, leaning into the air to get the truck moving, but I thought he looked a bit like Rose, arms spread, on the bow of the Titanic waiting for Jack to hold her. A box of oils is like a first-aid kit. And they really are. And unlike conventional medical drugs, they support body systems at a cellular level. They work to repair the body back to its original healthy state. Peppermint oil: This stuff is wonderful. It’s like consuming a Peppermint Crème (without all the added sugar and other junk!). Within minutes, a whiff of this punchy oil dissolved both Chris’s and my sister-in-law’s headaches that had been lingering around for hours. My mum also suffered vertigo the other week – the pills from the Pharmacy weren’t working, so I put a few drops of peppermint oil on a tissue and told her to sniff it. The oil significantly reduced her vertigo, and she continued inhaling it for the rest of the day. I also love popping a few drops on my tongue (this will really enliven you!) – it’s an awesome way to kick a cold or flu. Both Chris and I caught a nasty bug, and after not being able to shake it off, we began drinking the peppermint oil, and after a day or two we were as good as new. Peppermint oil also helps clears Chris’ sinuses and stops him snoring at night – winning!!! Lemon oil: This is great for the digestive system. I’ve suffered with heartburn for many years. I’ve learnt to control it by not eating aggravating foods (mostly grains), but sometimes it will pop up out of nowhere after eating foods that usually don’t affect me – nuts, eggs, fruit, salads. Even paints, perfumes and other chemicals can bring it on. Possibly a lack (or excess) of HCL acid, or even a symptom of leaky gut, or maybe my Phase 1 liver detoxification pathway not working 100%. Anyway, the other morning I felt the bile burn up my chest and neck after breakkie. I ran to my Aromatherapy book and found that lemon oil helps alleviate heartburn. So I quickly rubbed a few drops on my chest and seriously, it felt like the oil began to dissolve the regurgitated food stuck in my chest. I went about my business and 10 or so minutes later, no heartburn at all! Lemon is also a great stress-relief and helps to calm and lighten the mind. I’ve turned to inhaling the bottle when I start to feel edgy. RC: I have a blend of oil which is great for respiratory issues, among other things. My three-year-old Poppy had also caught the nasty bug that Chris and I had a few weeks ago, and it really affected her chest at night. One night in particular she had a coughing fit for two hours straight. I held her in my arms in my bed. By 2am I was feeling very helpless and tired. Such a little body convulsing with deep, hoarse coughs. In desperation, I turned on my lamp and searched for my oils. I grabbed the RC blend and rubbed a good number of drops on her chest. I didn’t care about being overly-generous, I just wanted her coughing to stop. It was truly amazing when Poppy stopped coughing immediately after I rubbed the oil in. Some may say it was coincidence, but if you look at the science behind essential oils, you will see that therapeutic-grade essential oils increase the frequency (electrical energy) of our bodies. A typical frequency of a healthy body is 62-68MHz. Someone with a cold will have a frequency of 58MHz. Someone with cancer a frequency of 42MHz. While a dying body will hit a low of 24MHz. Could it be that the oils ramped Poppy’s frequency back up to a healthy range, which consequently stopped her coughing? Lavender oil: I’ve also seen healing, soothing effects with lavender oil. Because of its nurturing qualities, as well as its endless list to help with many different conditions, this oil is likened to the Mother of all oils. I use this oil quite often on my 6month old Elsie because it’s very gentle and can be applied directly onto infants’ skin. Lavender has really helped Elsie with teething pains and also fevers. She was having a few days and nights of very restless sleep. Exhausted and desperate one night, I lathered her feet up with lavender, hoping she might sleep longer than an hour – low and behold she slept 5 hours straight. Again, coincidence? Or was it that the oils, massaged into her feet, travelled to her gums to reduce inflammation and her fever? There have been far too many ‘coincidences’ over the past couple of months for them to truly be ‘coincidences.’ I also used lavender oil (and frankincense oil which is a very rich, powerful oil, and with the frequency of ‘unconditional love’) on Poppy one night when she woke up in hysterics after having a nightmare. Nothing we did would snap her out of her screaming until I took off her PJs and rubbed the oils on her chest. She promptly stopped screaming and allowed me to carry her back to bed. The whole house smelt of lavender and frankincense and we all slept soundly for the rest of the night. 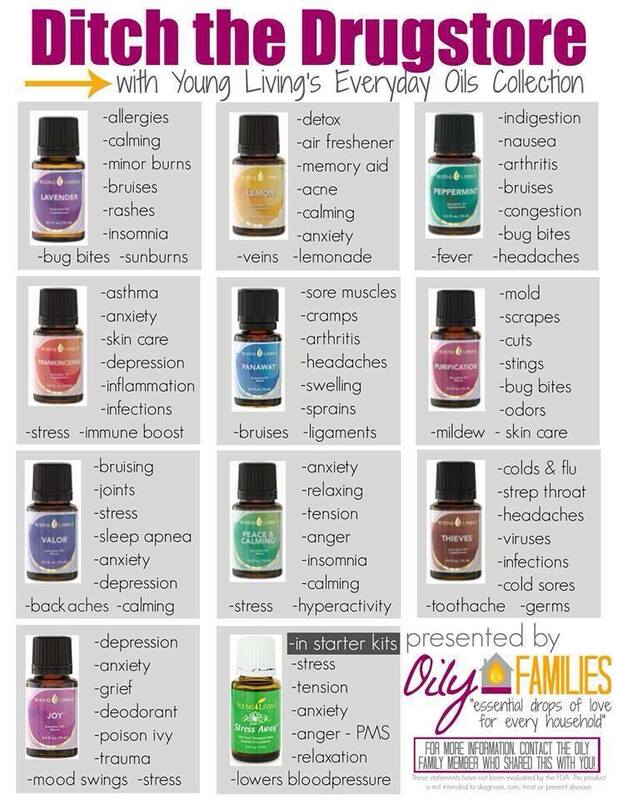 These are just a few examples of the power of essential oils working their magic in my family. I’ve also seen them encourage better sleep, aid in the recovery of sore muscles and minor injuries, reduce anxiety, clear up spots and scars on the skin, even increase libido!…But essential oils are so much more than a first aid kit. They can also work to bring balance back to the body, and to assist in the healing of ‘big’ illnesses too. They can help with emotional and hormonal balance. And, very basically, they are also just simply divine smelling and non-toxic and can be splashed all over your body, home and workspace. And of course you can make your own awesome all-natural cleaning, personal care and makeup products with them! The oils are intelligent, and know what your body needs – so even if you don’t have a lot of knowledge about aromatherapy, and which oils to use for what, using any oil will increase your health and wellness. Each drop of oil is pure sun energy harvested and distilled from plants. They were mankind’s first medicine, and have been used by many cultures across the world for thousands of years. So why, in our western society, which is so heavily reliant on lab-made drugs forced upon us by pharmaceutical companies, have we forgotten or become skeptical of nature’s medicine? If you are skeptical, or if the idea of using oils is completely new and foreign to you, why not try them out for yourself? Experiment, play, enjoy. What have you got to lose? You’ll soon see the therapeutic benefits of these little bottles of liquid beauty.